We’re going to the Caravan, Camping and Motorhome Show 2018 where we’ll have the return of our spin the wheel game, some great Caravan Guard prizes and show discounts. The doors open on February 20th until February 25th at Birmingham’s NEC, where visitors can expect to be wowed by more than 370 exhibitors from across the UK and Europe to create the UK’s biggest showcase of caravans, motorhomes, campervans, caravan holiday homes and lodges. Plus there’ll be many new season trailer tents and folding caravans all under one roof. 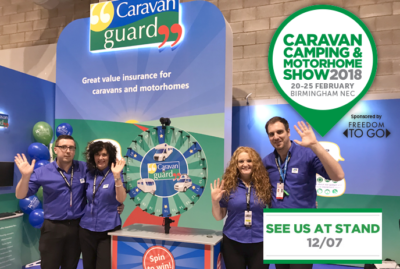 Our team of friendly advisers will be ready to answer any caravan or motorhome insurance related questions on stand 12-07 or can give you a quote for our 5 Star Defaqto rated caravan insurance and great value motorhome insurance. 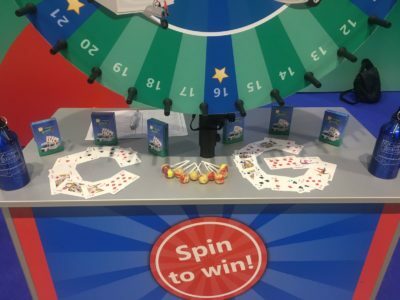 And visitors can play our spin the wheel game for a chance to win one of two Caravan Guard prizes, which include a durable aluminium water bottle or a pack of playing cards to keep you entertained on those wet, rainy days! So, why not give us a twirl! 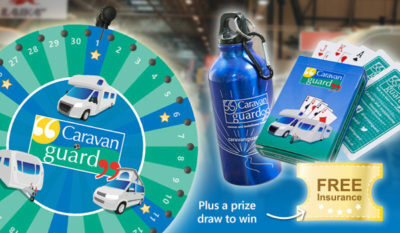 We’ll be tweeting prize winners using #caravanguard and posting regular updates on the Caravan Guard Facebook page. Not only will you be able to visit our team in Hall One, stand 12-07, you’ll be able to see all the latest caravan and motorhome models at the show and stock up on all your holiday accessories as well as gather ideas and advice on where to go and what to do when you get there. The family-friendly Caravan, Camping and Motorhome Show 2018 features everything you need for the perfect day out, with outdoor themed activities, guest speakers and cooking and walking inspiration. A celebrity line-up in the Discovery Theatre is headed by explorer Sir Ranulph Fiennes, sharing his adventuring experiences as well as ideas on why everyone should spend ’24 hours outdoors’ in 2018. And new attractions including a skate rink and holiday park experience, as well as favourites such as an assault course and climbing wall. To book advance tickets for £6.50 Senior (over 60’s) £7.50 Adults use discount code EX1* – saving you 50p on the standard advance price. *£6.50 Senior (over 60s), £7.50 Adult when booking before 23.59hrs 19/02/18 after which time prices revert to the on-the-door price of £9 Senior and £10 Adult. A £1.25 transaction fee applies. Calls cost 7p per minute plus your phone company’s access charge. Car parking is included in the ticket price. No dogs (except assistance dogs). Children 15 years and under go free when accompanied by a paying Adult/Senior. Tickets are non-refundable. I now use a petrol towcar, having recently replaced a diesel. It comfortably tows my 1350KG caravan and is rated at 1850KG maximum towing. The costs of diesel are often over looked when it comes to having to use ADDBLUE and general servicing costs. I tow a smaller caravan with a small family hatchback and there are no hybrid [or electric] vehicles suitable for towing. So I’ll stick to my diesel until the manufacturers offer an option. Thanks guys. I won a drinking bottle today!